The barking came suddenly from somewhere on Mount Royal. It was unmistakable. Ike, my husky mix, doesn’t usually bark at anything, but that was him, no question, I thought as I stood peering into the darkness from my deck. It was closing in on 1 a.m. I had been up working when Ike came in from the balcony antsy. I mistakenly assumed he needed to go out one more time before bed. It occurred to me that his mannerisms were slightly different, as if he were excited about something. I thought enough of it to hold him by the collar when we went outside. When I loosened my grip, he bolted off into the night toward Mount Royal. Ordinarily, I can just let him out, he’ll wander around the yard, do his business and come back in. But this was different. It took about 20 minutes before I heard the barking. Knowing something was up, I threw on my shoes, jumped in the Jeep and drove to the trailhead at Mount Royal. I pointed the Jeep toward the hill so the high beams would shine in the direction where the barking had come from. By the time I got out of the vehicle the barking had stopped. My concern grew. Was it a bear, a fox, a moose, a porcupine? Which would have the smallest consequence? I called to Ike. No response. Then there was a whimper. I heard a rustling noise coming from across the flats, somewhere up on the hillside just out of reach of my high beams. I moved swiftly toward the noise, calling for the dog again. With warm weather finally arriving in Summit County, wildlife is back out in full force. It’s time to be cautious out on the trails, especially when traveling with a pet. Wildlife encounters are increasingly common at this time of year. The only way to really avoid trouble between wildlife and pets is to keep pets on leash, said Juliette Hofford, a veterinary technician at Frisco Animal Clinic. Others recommend attaching bells to dogs when out on trails, in order to give wildlife notice so that a dog doesn’t surprise them. Early morning hours, dusk and nighttime are times when wildlife are more active. Leashing a dog is an especially good idea during those periods, Hofford said. Among the biggest wildlife concerns when hiking with a pet is a porcupine encounter. “In summertime it’s extremely common,” Hofford said. 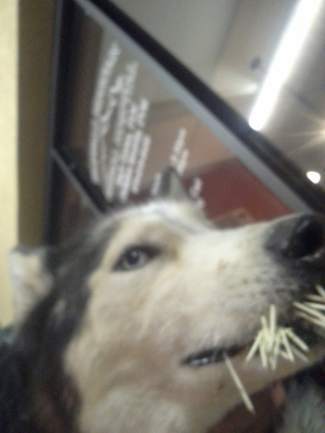 In fact, the animal hospital had already seen two pets with porcupine-induced injuries as of Saturday morning. “Dogs don’t learn their lesson,” she said. “We have six- to seven-time offenders” at the clinic. Hofford pointed out some misconceptions about quill injuries. Both she and Buffalo Mountain Animal Hospital veterinarian Mark Cowan said cutting the quills does not make them easier to remove. It can actually make them harder to pull out. Also, quills are not barbed at the end, as many people may think. The only way to get them out is to pull. Hofford strongly urged pet owners not attempt to remove quills themselves. Vets sedate animals before removing quills. Most get stuck in the mouth or face of a dog and can often make them head-shy in the future, if they aren’t anesthetized during the removal. Removal is also time sensitive. If left untended, the quills will work their way deeper into the skin, Hoffard said. Pet owners should take special care at night. Porcupines often sleep in trees and are less active during the daytime. Many pet interactions occur at night, area vets said. I continued to listen to the rustling coming from up the hill. Ike appeared slowly in the light of my high beams. As he came toward me I saw them. It looked like he had walrus whiskers protruding from his face. He seemed all right, though clearly irritated by the consequences of his encounter. This is going to be expensive, I thought, as he got close enough to confirm my suspicions. I got him into the Jeep and hurried back to the house to get the vet’s number. It was 1:30 a.m. by then. An automated system eventually connected to the on-call vet in Dillon. The voice on the other end said he would meet me at Buffalo Mountain Animal Hospital. Ike fidgeted all the way there, occasionally pawing at his face. I tried to keep him calm, while focusing on the road. He had started drooling heavily. Cowan met us at the clinic. “Hello, my friend,” he said to Ike, in a gentle tone. Cowan proceeded to let us in and lead us to an examining room. He continued to talk to Ike in a calm voice. “It’s OK, my friend,” he kept saying as Ike continually adjusted his jaw and attempted to paw at his face. Cowan asked me hold on to Ike while he injected a sedative. Almost immediately, the dog’s head began to droop. Within a minute he was completely out. The doctor and I lifted him up on the examination table. I could hear Ike breathing; he twitched occasionally and made the faintest of sounds. Lifting Ike’s limp head, the doctor pulled close to 30 quills from his mouth and snout with a pair of pliers. He told me Ike was his second porcupine call of the evening. The quills pulled from the last dog still sat on the counter nearby. The doctor pulled all of them out quickly, with what looked like some force. I couldn’t imagine anyone trying to do it with a conscious animal. The last quill broke off in Ike’s upper lip as the doctor tried to remove it. He messaged Ike’s gums just as one might do when trying to remove a splinter from a hand. The fragmented quill wouldn’t come out. Cowan said not to worry; it would eventually come out on its own. He then gave Ike a second injection to draw him out of his slumber. He came to gradually, stumbling like a drunk on the way to the car. At home he stumbled up the stairs. When he made it to his bed, he seemed too disoriented to lie down. Eventually the signals between his brain and his legs connected, and he lay down and went to sleep. In the morning it was as if nothing happened. He was up and chipper, not in the least concerned that my bank account was $320 lighter. I learned my lesson, though I’m not so sure he did.